Current issues in today’s news along with new requirements from the SEC, industry certification organizations, Board of Directors and customers are driving executives to revitalize their Enterprise Risk Management (ERM) program. The Financial Services and Insurance industries have very well defined risk frameworks that can be utilized to get an ERM program up and running. But businesses outside of these industries may be struggling to mature their ERM programs. 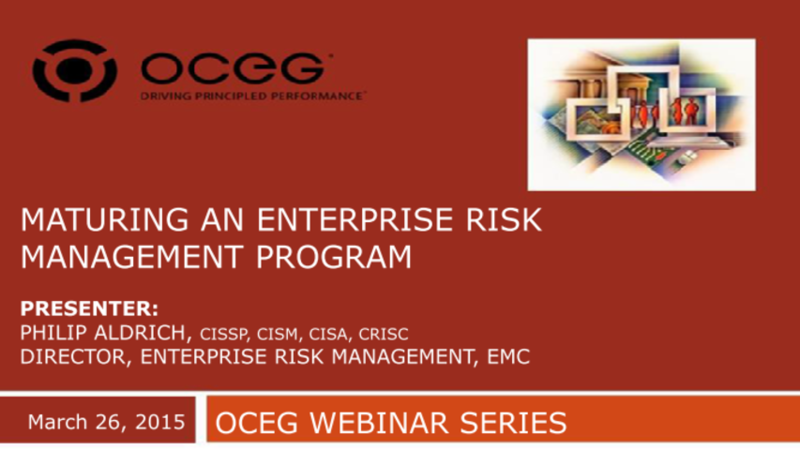 In this webcast, we are joined by Philip Aldrich, Director of Enterprise Risk Management at EMC, to offer simple guidance that will allow you to gain significant ERM program traction with your organization. EMC is a global leader in enabling businesses and service providers to transform their operations and deliver IT as a service and has spent the last two years significantly maturing their enterprise risk strategy. Phil will outline the common difficulties encountered when getting an ERM program started and provide a simple roadmap to build your Enterprise Risk program “toolkit”. He will highlight how EMC drove risk management consistency to support Board of Director level reporting. We have emailed instructions to access Maturing an Enterprise Risk Management Program Slide Deck to . Make sure the email arrives in your inbox: either add "support@oceg.org" as a safe sender to your email platform, or if you use Gmail, drag our email into your Primary tab.